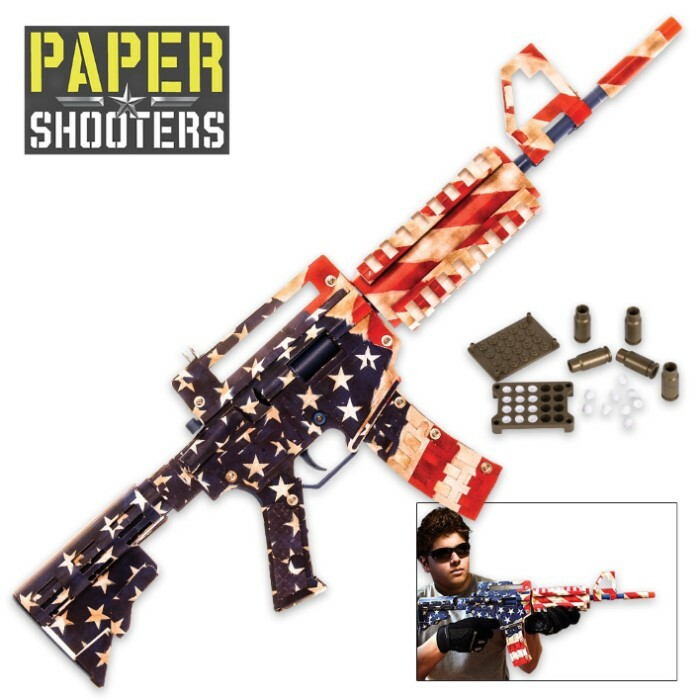 Paper Shooters Patriot Tactical Rifle-Style American Flag Skin Paper Gun and Ammo Construction Kit | BUDK.com - Knives & Swords At The Lowest Prices! The era of shooting spitballs from drinking straws has come to a close. Now dawns the epoch of Paper Shooters - do-it-yourself gun kits that fire 100 percent paper ammo up to an incredible 65 feet! A far cry from those saliva-soaked balls of notebook paper you blew through a straw in middle school, Paper Shooters feature ejecting shells and blast “soft splat” paper ammo you make yourself with ordinary paper. For an additional dose of fun, Paper Shooters are supplied in construction kit form, allowing you to build the whole thing from scratch including air chamber, trigger system and the awesome interchangeable skins. 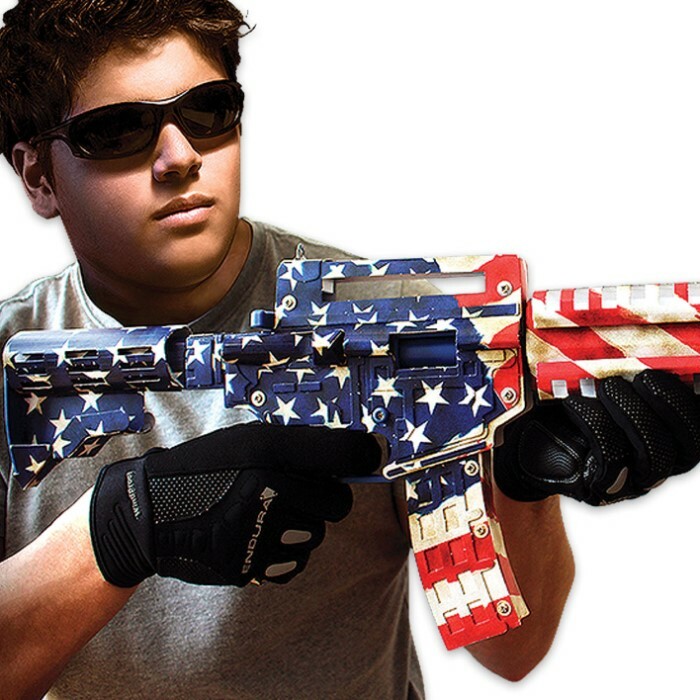 Once built, the “Patriot” mimics a modern tactical rifle (e.g., AR15/M4) donned in the red, white and blue stars and stripes of Old Glory. The 141-piece Patriot kit also includes molds to create an endless supply of paper pellets. Got paper? Got ammo! Just dip them in water for 20-30 seconds, load them into the six included ejecting shells and blast away! Makes a perfect gift for any child or child-at-heart who loves to build and shoot things. And, really, who doesn’t? 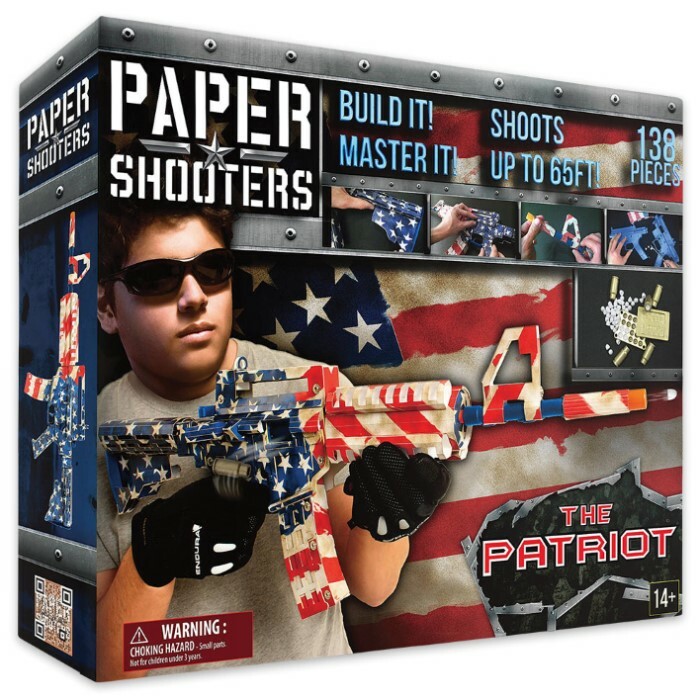 From engineering and construction to playful battling, the Patriot Paper Shooter is loads of fun for the whole family - a terrific way to bring everyone together!